Figure 1: Settings dialog - Instruments - Oscilloscopes - Load. When an oscilloscope is detected by the Multi Channel oscilloscope software, it can be opened and listed in the object tree. Additionally, the opened oscilloscope can be initialized with predefined settings from a settings file when init with is checked. Select a settings file using the file open button . When an oscilloscope is detected by the Multi Channel oscilloscope software, it will be opened and listed in the object tree. When start after opening is checked, the oscilloscope will start measuring automatically. Never The oscilloscope(s) will be stopped. Any data loaded into the oscilloscope(s) will remain in the instrument(s). Always The oscilloscope(s) will be started. Note that any data loaded into the oscilloscope(s) will be overwritten after a measurement is performed. Keep same state If oscilloscope(s) are measuring, they are restarted after loading. As loaded The state in the loaded setfile will be used. Maximum number of instruments determines how many of the detected instruments are automatically placed in a graph. 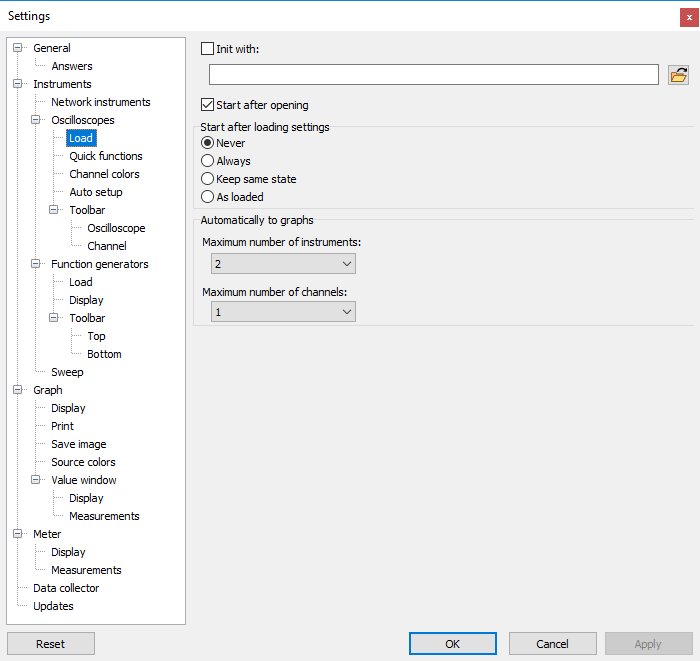 Maximum number of channels determines the maximum amount of channels that is automatically placed in a graph.